Minford’s Nathan McCormick brings the bal up the floor for the Falcons. Valley’s Tyler Mitchell attempts to drive to the rack against Minford’s Darius Jordan on Friday evening. 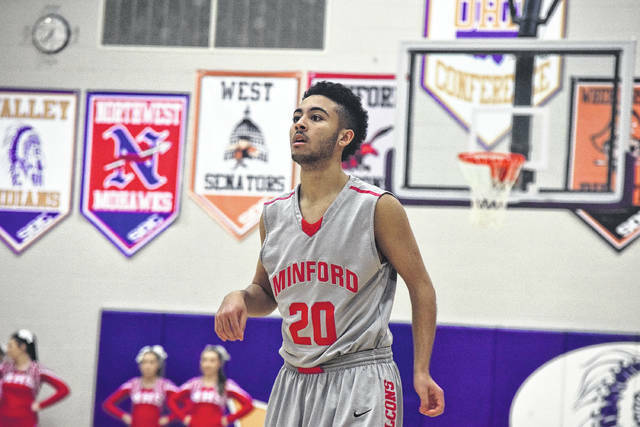 Minford’s Elijah Craft was a huge spark plug throughout the affair. His play, along with the effectiveness of Elijah Vogelsong-Lewis, had Minford head coach Josh Shoemaker signing the praises of the pair after Friday’s game against Valley. Valley’s Brady Lykins goes up for a layup during the third quarter as Minford’s Darius Jordan trails the play. Valley’s Tanner Cunningham brings the ball up the floor for the Indians on Friday evening. Minford’s Darius Jordan brings the ball up the floor against Valley on Friday evening. 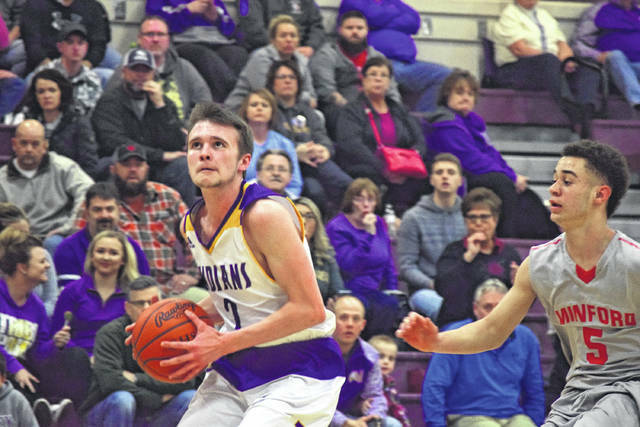 LUCASVILLE — Well-played rivalry games are always fun to take in and behold as a fan. 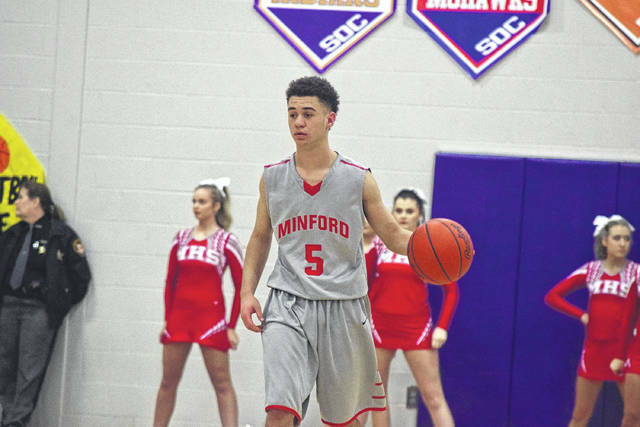 And even though the final spread of an SOC II boys basketball affair between the Minford Falcons and the Valley Indians looked like a comfortable Minford victory, numbers — while they do tell a lot of the story much of the time — aren’t always what they seem. After taking as much as a 12-point lead near the end of the third quarter of action, AJ Phillips’ Valley club battled its way back from the deficit of an even dozen to close within four, 53-49, with less than two minutes to go in the contest. However, after both teams frantically fought for possession of a loose ball on Minford’s end of the court, Nathan McCormick took matters into his own hands. The sophomore’s jumper with 1:49 to play proved to be the bucket that the Falcons needed to keep the point for good as Josh Shoemaker’s unit held off a gritty Valley effort — which included 11 third-quarter points from Brady Lykins and 10 fourth-quarter tallies from Tanner Cunningham — en route to taking home a 61-49 victory over the Indians on Friday evening in a hard-fought battle between both teams in Lucasville. 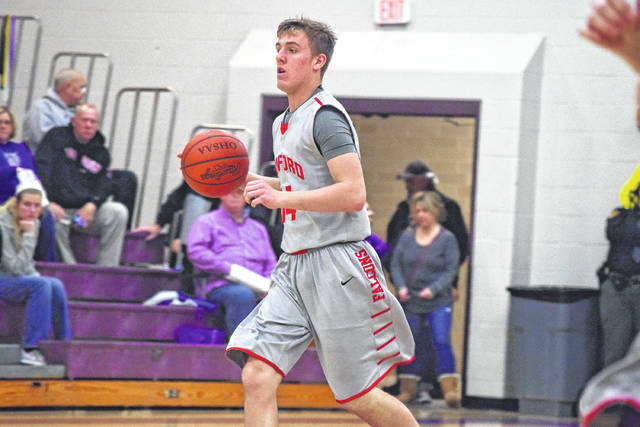 For Shoemaker, the effort that Minford put together on the defensive end of the floor en route to scoring the victory was nothing less than that of a Grade A effort. As for Phillips, he couldn’t find much fault in his squad’s efforts, either. In fact, the difference in the affair, according to the first-year head coach, was all about the ability to put the ball in the basket. Throughout much of the first quarter of action, the defensive work that both teams put together showed up in spades as each side held the other without a field goal over the first 3:59. During that timeframe, each unit combined to miss their first nine shots from the floor before Cameron Dalton took matters into his own hands with a low-post bucket through traffic that ultimately commenced an 8-3 Minford spurt. But with the Falcons up by a 9-4 count and time winding down in the first quarter of action, Valley proved that it wasn’t going anywhere anytime soon. 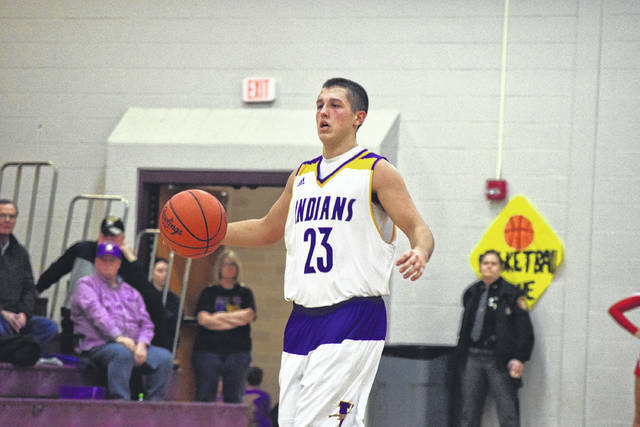 In fact, the Indians, behind five straight points from Connor Fell and a trey from Tyler Mitchell, used a 10-0 run between the first and second quarters of action to ultimately allow Valley to obtain a 14-9 lead just under a minute into the second quarter of action. 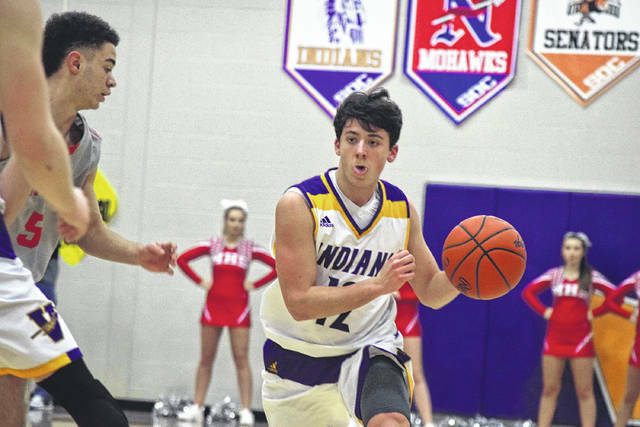 Much of that offense was created by the abilities of Andrew Shope to get the Indians into an effective offensive set, which allowed Valley to not only establish a rhythm, but get star Minford guard Darius Jordan into foul trouble in doing so. With Minford now needing a spark with one of its key starters on the pine for the remainder of the half, the Falcons got just that in the form of Elijah Craft and Elijah Vogelsong-Lewis, who used their gritty defensive efforts to get Minford out in transition. Craft, who also scored five huge points in the quarter by fighting his way through traffic and getting to the foul line, and Vogelsong-Lewis, who played a sound game in effectively bringing the ball up the floor along with Craft, also got help from Kelton Kelley, who canned two big treys en route to leading Minford on a 17-6 run over the final six and a half minutes of the second quarter en route to obtaining a 26-20 lead for the Falcons at the halftime break. In the third quarter, both offenses really began to heat up thanks in pair to the contributions of five talented starters. With Jordan back in the lineup after being saddled with foul trouble in the first half, the sophomore wasted no time making his limited minutes count on the scoreboard. After going scoreless in the opening pair of stanzas, Jordan notched eight points in the third quarter alone en route to a 13-point outing. His play also opened up additional looks for McCormick and Kelley as the former scored five of his 11 points in the third quarter while the latter also scored five points in the third frame en route to a game-high 16 points. But as Minford looked like it was going to put the game away, Valley came back with one counterpunch after another thanks to the efforts of Shope and Lykins. The latter, especially, proved to be red-hot during the third quarter en route to scoring 11 of his 14 points in the frame — including a big three-pointer with just three seconds remaining in the third quarter of play — to trim the Falcons’ advantage to a 44-35 margin after three quarters of action. In addition to his third quarter outburst, Lykins held Breydan Tilley to just two points over the final three quarter of play after Tilley scored four points over the first six minutes of the contest. Lykins’ three-pointer ultimately proved to be a critical part in a massive spurt for Valley, which saw star three-sport athlete Tanner Cunningham take off on the scoresheet. After fighting inside for a basket to begin the fourth quarter, Cunningham proceeded to nail a pair of free throws, hit the back end of two additional free throw attempts, and nailed a trey from the left wing after a good passing display between the junior and Lykins to account for eight of Valley’s 11 points in an 11-2 spurt that ultimately brought the Minford lead to just 46-43 with six minutes to go in the contest. Cunningham ultimately finished with a team-high 15 points for the contest. With the margin at three points, however, Minford found resolve. Another low-post basket from Dalton, along with a transition basket from Tilley and a huge acrobatic layup that resulted in a successful and-one from Jordan, allowed the Falcons to answer the 11-2 run with a 7-2 spurt that ultimately put Minford up by a 53-45 tally with 4:08 to go. Valley, however, didn’t give in. After both teams traded a share of unsuccessful transition opportunities, Cunningham drew a foul to obtain a pair of free throws, while Tyler Mitchell put up a mid-range jumper to cut the lead to a 53-49 count. But after forcing a pair of turnovers to draw within four, Minford didn’t allow Valley to force a third. After fighting for the ball and seeing it bounce off of the hands of several Falcons and Indians, McCormick grabbed the loose ball, got to his sweet spot, and with less than two minutes left, nailed an elbow jumper that ultimately allowed Minford to close out the contest with eight straight points. With the victory, Minford improved to 7-12 overall and 6-6 in SOC II action. The Falcons will get back to work next Friday when Minford takes on Waverly in its next-to-last SOC II bout of the year. As for Phillips’ Indians, Valley, who fell to 3-13 overall and 2-9 overall in SOC II action, will look to rebound when the Indians face Paint Valley in Bainbridge on Monday evening.